2016 will be remembered as the year Donald Trump—a wealthy, narcissistic political novice with a strong authoritarian bent—was elected president of the United States after campaigning against economic globalization. The events are fresh enough in many people’s minds that feelings are still raw and the implications are both unclear and, for many, terrifying. For those who have spent years, in some cases decades, denouncing globalization and seeking to build a localist alternative, this is surely a vexing and confusing moment. When the World Trade Organization’s ministerial conference in 1999 erupted into “the Battle of Seattle,” demonstrators voiced arguments that might resonate with the average Trump voter. They asserted that, for the United States, globalization was resulting in the offshoring of manufacturing that would otherwise have occurred domestically; that while American consumers were gaining access to cheaper consumer products, the hourly wages of workers were stagnating or falling in real terms due to competition with foreign labor; and that the investor class was benefitting significantly while the wage class was losing ground. All of these points were more recently driven home, to great effect, by The Donald. However, the localist critique of globalization went much further than anything Trump himself has articulated. Anti-globalization activists decried a “race to the bottom” in environmental protections with each new trade deal, as well as the global loss of thousands of indigenous languages and locally-adapted forms of architecture, art, agriculture, and music in favor of a uniform global commercial culture dominated by corporate advertising and centralized industrial production methods. Further, teach-ins organized by International Forum on Globalization (IFG) beginning in the 1990s; books by the movement’s intellectual leaders (John Cavanagh’s and Jerry Mander’s Alternatives to Economic Globalization; Kirkpatrick Sale’s Dwellers in the Land and Human Scale; Michael Shuman’s Small-Mart Revolution and The Local Economy Solution; Helena Norberg Hodge’s Ancient Futures); and thousands of on-the-ground locally rooted cooperative efforts scattered worldwide promoted a vision of a green, sustainable, equitable bioregionalism. 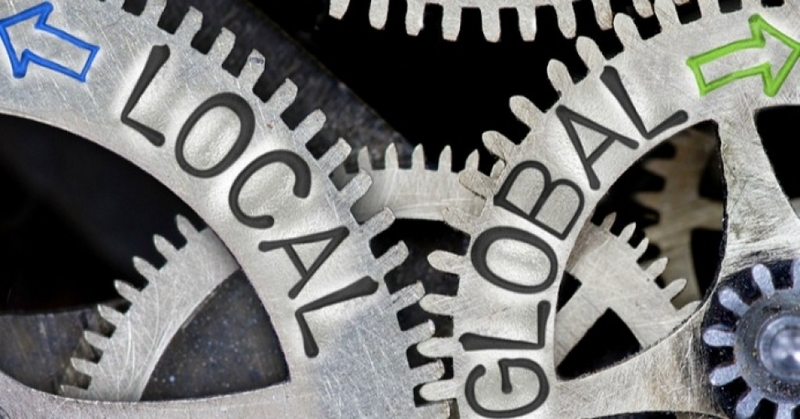 Throughout the last couple of decades, some on the political left argued against localism and for globalism. Returning to a politics and economics centered in the community, it was said, would undermine the grand liberal vision of a borderless world with protections for human rights and the environment. Liberal globalists argued that climate change can only be fought with international treaties. It is by becoming global citizens, they intoned, that we can overcome ancient prejudices and fulfill humanity’s evolutionary destiny. Localists responded that, in practice, economic globalization has nothing to do with moral elevation or with worker and environmental protections, but everything to do with maximizing short-term profit for the few at the expense of long-term sustainability for people and planet. That philosophical dispute may continue, but the context has shifted dramatically: the commanding new fact-on-the-ground is that the American electorate has for now sided with the anti-globalist argument, and we face the imminent presidency of Donald Trump as a result. Should localists declare victory? As we’re about to see, the situation is complicated and holds some opportunities along with plenty of perils. True, voters rejected a predatory trade system that, in Helena Norberg Hodges’s words, “put ordinary people in permanent competition with each other.” However, Trump is not a one-man government; nor does he stand at the head of an organization of people with a coherent critique of globalism and a well thought-out alternative program. His administration will reflect the ideas and ideals of hundreds of high-placed officials, and Trump’s key appointees so far consist of business leaders, Republican insiders, and former lobbyists. They also stand to be the wealthiest cabinet in the history of the U.S. government. Crucially, not even Donald Trump himself has a clear idea of how to actually implement his stated intention of bringing back jobs for American workers. His first stab at the task, persuading the Carrier company not to move its air conditioner manufacturing operations to Mexico (actually, fewer than half the jeopardized jobs were saved), entailed doling out huge tax breaks—a tactic that Bernie Sanders rightly points out will simply lead to other companies announcing outsourcing plans so they can win similar concessions. Let’s be clear: Trump’s ascendancy probably represents not a victory for localism or even populism, but merely a co-optation of legitimate popular frustrations by a corporatist huckster who intends to lead his merry band of cronies and sycophants in looting what’s left of America’s natural and cultural resources. This would be the antithesis of green localism. Indeed, we may see an activist federal government attempt to trample local efforts to protect the environment, workers’ rights, or anything else that gets in the way of authoritarian corporatism. Congress may train its gun sights on local ordinances to ban fracking and GMOs, and on firearm regulations in states with the temerity to stand up to the NRA. Trump’s message appeals as much to tribalism as to anti-globalization sentiments—and only to members of certain tribes. [T]his guy talked about ending our disastrous trade policies, something I’ve been fighting for 30 years. He talked about taking on the drug companies, taking on Wall Street, taking on the overall political establishment—‘draining the swamp.’ We will see to what degree there was any honesty in what he was saying. Trump has also promised to keep America from invading more countries. Good luck with that. Specifically for localists, there may be opportunities to collaborate on the revival of domestic manufacturing. However, if that happens on Trump’s terms, the lion’s share of benefits will likely go to business owners. Trump says he wants to spend a trillion dollars on infrastructure for the country, and many localists would agree the nation needs an enormous investment in electric rail, public transportation, and renewable energy technologies if it is to mitigate climate change and the impacts of oil depletion. Yet the infrastructure Trump favors consists mostly of more fossil fuel-dependent highways and airport runways, which we already have way too much of, thank you very much; and he proposes to get that infrastructure built by giving tax breaks to corporations, whether they actually produce anything or not. Collaboration with authoritarian leaders always leads to moral quandaries, as Masha Gessen details in a recent thoughtful essay in New York Review of Books. But there may be few incentives to tempt localists to work with a Trump administration. Another strategic response to the new leader would be resistance: block him from doing bad things, voice displeasure in creative and strategic ways, and pour metaphoric sand in the gears of the new administration. There will likely be lots of awful things to oppose, including efforts to privatize public assets, including federal lands and even whole government agencies; efforts to weaken consumer protections, women’s rights, immigrant rights, worker protections, environmental regulations (including reversals of steps to deal with global climate change and stays on oil pipeline construction); assaults on civil rights and civil liberties, workers’ rights, prisoners’ rights, public education, and more. States can significantly slow down or reverse federal policies simply by dragging their feet and doing the bare minimum necessary. That’s how state and localities have thwarted federal education reform over the last several years. Sometimes states just pull their enforcement resources. . . . Some states even engage in a form of civil disobedience, as many did in refusing to enforce parts of the Patriot Act.
. . . cities including Chicago, Los Angeles, and San Francisco have promised to be sanctuary cities for undocumented immigrants, while Governor Andrew Cuomo has insisted that New York will be a “refuge” for Muslims and other minority groups. These promises have made the incoming administration so nervous that it has threatened to cut off all federal funding—a threat that is plainly unconstitutional. This Trumpocalypse scenario probably won’t materialize, and we should all pray it doesn’t; I describe it here only because it seems far more likely to occur under the coming presidency than any in recent memory, for reasons I’ll return to below. In any case, the Trump administration may be shaping up to be one of the most centralist and anti-local in history, battling thousands of communities determined to thwart and resist federal policies at every step. One line of resistance deserves special attention: the protection of vulnerable places. All geography is local, and the salvation of that grand generality, “the environment,” often comes down to a fight on the part of local citizens to defend a particular river, forest, or at-risk species. This is likely to be especially true during the tenure of a federal administration committed to rolling back national environmental regulations. As important as resistance efforts will be, pouring all our energy into opposition may be poor strategy. Just as important will be building local alternatives—cooperative institutions and enterprises, including community land trusts, city-owned public banks, credit unions, and publicly owned utilities investing in renewables. Such constructive efforts have, after all, always been the main work of committed localists. Transition U.S. recently published a report highlighting “25 enterprises that build resilience,” including Bay Bucks, a business-to-business barter exchange program in California’s greater San Francisco Bay Area with more than 250 participating local businesses; CERO in Boston, MA, a worker-owned energy and recycling cooperative; Cooperative Jackson, in Jackson MS, which is developing a network of cooperatives engaging in a range of services and pursuits from child care to urban farming; and Co-op Power, a network of regional renewable energy cooperatives in the Northeastern U.S. These are merely representative examples of what amounts to a fledgling global movement that has emerged partly in response to the Global Financial Crisis. It goes by various names—the sharing economy, the solidarity economy, the cooperative economy, the local economy movement—and takes many forms, all with the aims of decentralization and self-organization, and of meeting human needs with a minimum of environmental impact. Sometimes municipal governments get involved, investing public resources into worker-cooperative development. Further, localist successes are often shared internationally—in programs such as Sister Cities International and United Cities and Local Governments (UCLG), which is effectively an international league of municipalities—so as to seed similar efforts far afield. The next four years may be a time when much that is beautiful and admirable about America is attacked, looted, liquidated, and suppressed; and when some of the more shameful elements of the country are empowered, amplified, and celebrated. If there is a political corollary to Newton’s third law (for every action there is an equal and opposite reaction), then the radical policy shifts promised by Trump will engender an enormous backlash. It is as yet unclear what forms that backlash will take, but much of the energy unleashed will be expressed locally. The wider historical context within which Trump and anti-Trump forces collide will have enormous significance. While there is often no way to predict events like natural disasters, major terrorist attacks, or the outbreak of a major war, there are sometimes prior warnings. Currently one warning sign is flashing bright: the likelihood of a serious economic downturn within the next four years. Debt levels are unprecedented, a cyclical recession is already overdue, and our oil-based energy system is running on fumes. Hard times for the economy usually result in rejection of the government that’s in charge when the crisis happens to hit. Which means the anti-Trump reaction will likely eventually be intensified even further, though it also means the Trumpocalypse scenario described earlier in this essay might have a handy trigger. Trump voters were not all racists, misogynists, and xenophobes. Many were simply ordinary Americans fed up with a government that tolerated or actively supported the dismantling of the American middle class through global trade deals and corporate influence, and who also sensed the decline of American civilization (which, it must be said, is inevitable in some way or form). They voted for a man who promised to make America great again; what they’re actually likely to see is more economic turmoil. Trump promised not to touch Social Security, Medicare, or Medicaid, but the team he’s heading promises to gut those programs. One way or another, many Trump voters will likely feel betrayed. This could translate to a deepening national political cynicism, or to action. Can we enlist those people and many others not just in opposing Trump, but also in building genuine local alternatives to the globalist excesses that elected Trump in the first place? That can only happen as the result of thousands, perhaps millions of honest conversations among neighbors, friends, and relatives, in towns and cities across the nation. Arguments about politics often accomplish little, but efforts to find common ground in community projects that meet people’s needs could eventually change everything. Localism done right—that is, in an inclusive rather than exclusionary way—offers the best path toward maintaining and building national cohesion. And stronger communities, local economies, and greater self-reliance are all things that many people in Trump’s America would support. Localism is a long, slow, patient path that requires trust, patience, and hard work. Such mundane work may sound boring in a time of political crisis and turmoil. But it may soon get a lot more interesting. Richard Heinberg is a senior fellow at the Post Carbon Institute and the author of twelve books, including his most recent: Afterburn: Society Beyond Fossil Fuels. Previous books include: Snake Oil: How Fracking’s False Promise of Plenty Imperils Our Future; The Party’s Over: Oil, War, and the Fate of Industrial Societies; Peak Everything: Waking Up to the Century of Declines; and The End of Growth: Adapting to Our New Economic Reality.